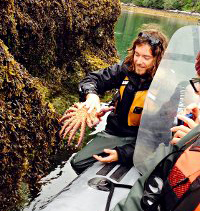 Exploring the Islands' rich marine world, towering old growth forests, and Haida culture has instilled us with a deep fascination and appreciation for the natural world around us. It is this fascination, combined with the unparalled treasures of the islands, that we wish to explore with you. An active out-of-doors lifestyle has given us a spirited and energetic approach to all our endeavors. As your hosts, your safety and comfort is our primary concern. As professional guides and adventurers, we continuously train to maintain a high standard of safety and education. We have extensive advanced wilderness first aid training, and are active wilderness leaders. Many of our staff were born and raised on the islands or on the mainland coast. Whether we are full time or seasonal residents, the rhythm of the ocean, the almost supernatural beauty of our surroundings, and the unexpected magic of the Islands have brought us back year after year. We look forward to exploring with you this summer. Sonia studies fish, wildlife and ecological restoration at BCIT. She has been a dogsled guide in the Canadian Arctic and in Chilean Patagonia. She was born and raised on the west coast near Vancouver. She visited Haida Gwaii on a solo road trip and loved it so much she came back to work as a guide. Bryan came to the islands in 2011 with adventuring in mind and left with a well-fitted job driving boats and sharing his love and knowledge of the wilderness. Bryan was born in Victoria, BC and enjoys an abundance of outdoor activities that range from kayaking, fishing, surfing, and general beach browsing. With summers spent on the coast, Bryan plans on traveling the rest of the country in the off season with hopes of ending up at the other ocean and onwards from there. 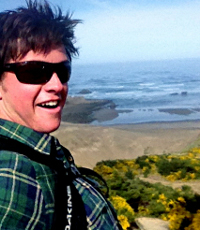 Jo (Jonathan} joined Moresby Explorers in the summer of 2018, after intermittently tree planting around BC and teaching Outdoor Education in Hong Kong. An adventure enthusiast, trained teacher and people lover, Jo’s favourite tour is the 4-Day, where there is more opportunity to get to know guests in depth and do some exploring! Alex is as solid as the trees he so loves. Having worked in forestry for years, Alex now seems happy to be surrounded by humans to chat with (likely more responsive than spruce). Alex was born in Toronto and achieved a thespian degree before travelling to the Caribbean and becoming a divemaster. Eventually he returned to BC for a season of tree planting where he met the love of his life. In September 2018 Alex and Haley got married on the north coast of Haida Gwaii - a beautiful ceremony that celebrated the pair as well as the recent purchase of Moresby Explorers. Play time’s over kiddos! Chantal “Prawn” has been training in the ways of Office Wizardry at Moresby Explorers since 2016. She first arrived on island as a well-travelled, but green-to-the-ways-of-Morex-life individual. She has since soaked up knowledge and experience as an insatiable sponge does. She’s discovered the peace of coho fishing on a crisp September day, the fun of frolicking through the forest in pursuit of berries, mushrooms and the ever present Sitka Black-Tailed deer. And the frustration of trying to problem solve entirely novel problems (like that weird sound coming from the engine, or how to be in two places at once) and the elation of success! She holds a Bachelor of International Relations, a Master of Journalism and African Studies and a keen sense of wanderlust. She can usually be spotted trail running the Dover, or with her nose between the pages of a novel. That is, of course, during the off season, because from May-September, she lives full time in the office. Oliver rarely stands still. Even when relaxing, one can almost hear the wheels unceasingly churning away if they listen close enough. When forced to sit his fingers strike up a complicated drum beat on the nearest surface, adding groove to the problem solving creativity on constant loop between his ears. After a life largely lived on the move, Ollie landed in Haida Gwaii and soon knew it had him by the heartstrings. He and partner Winnie purchased land in Queen Charlotte/Daajing Giids in 2016, and Moresby Explorers a couple of years later. Ollie is particularly fond of cheese, toast and new challenges, fortunately he’s found somewhere with both. Jessie was born and raised in BC and loves playing outside. 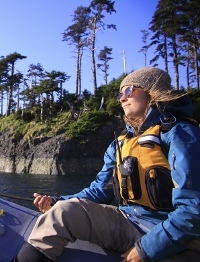 She recently completed an Adventure Management Diploma at Thompson Rivers University where she learned wilderness and leadership skills that she enjoys putting into practice in the dynamic environment of Gwaii Haanas. Her favorite thing about Haida Gwaii is that she learns something new every day. In her spare time, Jessie enjoys hiking, skiing and visiting new places. Bryan Smith is Morex’s resident jack of all trades and shop guru. With a background in environmental sciences, he is often requested by different ecological research groups that use our services to get to and from fieldwork locations. He lives in Sandspit with his husky-lab-cross SGaana, and spent the winter building the company’s first large scale greenhouse! 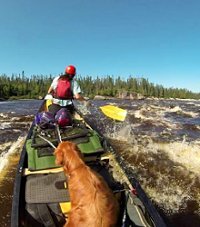 Marilyn grew up in the small town of Abitibi, Quebec, where she learned to love the outdoors, camping, fishing, exploring and being in and on the water. Since moving to BC in the summer of 2008, she has fallen in love with the West Coast and taken every possibility to return while also completing a program in Bio-resource Engineering at McGill University. After completing her program she found work in Nunavik, Yukon Territory, doing environmental monitoring, but as much as she loved the arctic she still felt the call of the coast and a 'milder' climate. Marilyn began guiding with Moresby Explorers in 2015 and during the off season she plans to go moose hunting with her family in Quebec. Caresse is a vibrant, multi-talented and creative whirlwind. She first joined Moresby Explorers as a float camp cook in 2017 where she painted the walls, turned bracket mushrooms into works of art and composed a number of beautiful nature films (in addition to her regular duties as cook and host!) She has since expressed desire to learn the tricks of the guide trade, so keep an eye out for a new captain! Kelsey was born and raised in the Tow Hill Road Community outside of Masset. She has been cooking for over 10 years, mostly here on Haida Gwaii, and she started as a float camp cook with Moresby Explorers in 2011. 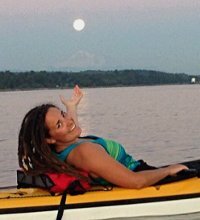 Kelsey is also a certified kayak guide and always willing to give pointers on paddling technique to any interested guests. Her interests include hunting and wild harvesting, sewing, training her dog Berkeley (to take over the world) and watching Doctor Who.